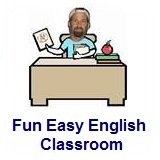 ﻿ Fun Easy English - new classroom free online classes english language lessons speaking listening writing reading september. 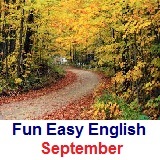 This month Fun Easy English Classroom celebrates another American holiday, Labor Day. Learn all about this holiday which is the unofficial end of Summer in the United States. Grammar focus this month is on clauses and sentences. September 23 - September equinox - Test your reading comprehension about September equinox.